The purpose of this study was to determine the incidence of central vein stenosis and occlusion following upper extremity placement of peripherally inserted central venous catheters (PICCs) and venous ports. 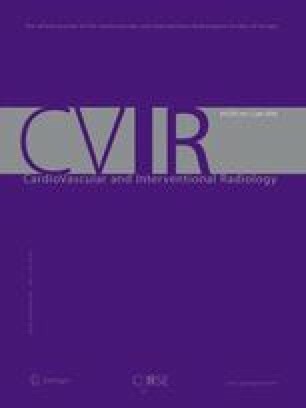 One hundred fifty-four patients who underwent venography of the ipsilateral central veins prior to initial and subsequent venous access device insertion were retrospectively identified. All follow-up venograms were interpreted at the time of catheter placement by one interventional radiologist over a 5-year period and compared to the findings on initial venography. For patients with central vein abnormalities, hospital and home infusion service records and radiology reports were reviewed to determine catheter dwell time and potential alternative etiologies of central vein stenosis or occlusion. The effect of catheter caliber and dwell time on development of central vein abnormalities was evaluated. Venography performed prior to initial catheter placement showed that 150 patients had normal central veins. Three patients had central vein stenosis, and one had central vein occlusion. Subsequent venograms (n = 154) at the time of additional venous access device placement demonstrated 8 patients with occlusions and 10 with stenoses. Three of the 18 patients with abnormal follow-up venograms were found to have potential alternative causes of central vein abnormalities. Excluding these 3 patients and the 4 patients with abnormal initial venograms, a 7% incidence of central vein stenosis or occlusion was found in patients with prior indwelling catheters and normal initial venograms. Catheter caliber showed no effect on the subsequent development of central vein abnormalities. Patients who developed new or worsened central vein stenosis or occlusion had significantly (p = 0.03) longer catheter dwell times than patients without central vein abnormalities. New central vein stenosis or occlusion occurred in 7% of patients following upper arm placement of venous access devices. Patients with longer catheter dwell time were more likely to develop central vein abnormalities. In order to preserve vascular access for dialysis fistulae and grafts and adhere to Dialysis Outcomes Quality Initiative guidelines, alternative venous access sites should be considered for patients with chronic renal insufficiency and end-stage renal disease.